The model EPC-12207 is an all solid state timer intended for use in any application which requires an external load circuit to be energized for an interval of time each time the start switch of the timer is momentarily pressed. The timing period is set by a 32 position rotary switch which adjusts the timer from OFF to the maximum time specified by the model number. As a complete timing assembly, the EPC-12207 is ready to mount behind a front panel to form an integral timing controller. Operating Voltage 12, 24, 48, & 110V DC, 24, 48, 115V AC 50 / 60 Hz. 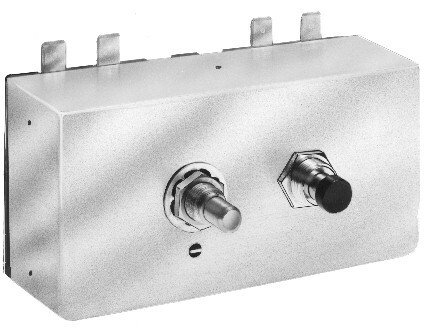 Output Rating Solid State Switch. AC units, loads from 10 milliamperes to 1.0 ampere inductive. DC units, loads from 5 milliamperes to 12 amperes. Timing Mode Single Shot Interval. Transient Protection Zener type voltage limiting device and an MOV rated to 25 Joules in accordance with unit Input Voltage. Operating Temperature -20 deg C to 85 deg C.